Plan B never stands alone. The absent, unspoken Plan A both precedes and accompanies it, a mocking reminder of how Plan B came about. 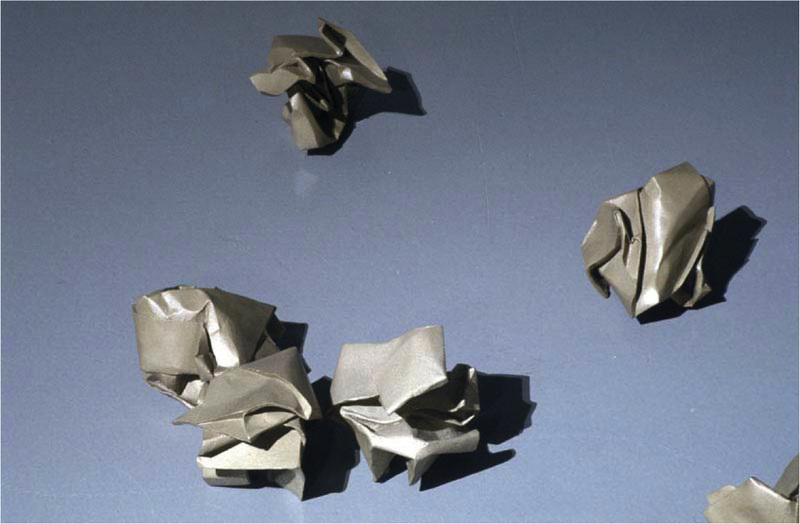 Bronze casting transforms pieces of crumpled paper, ephemeral indexes of rejected ideas, into commemorative objects. The weight of each castoff goes against the notion that failure can be easily discarded or swept away. 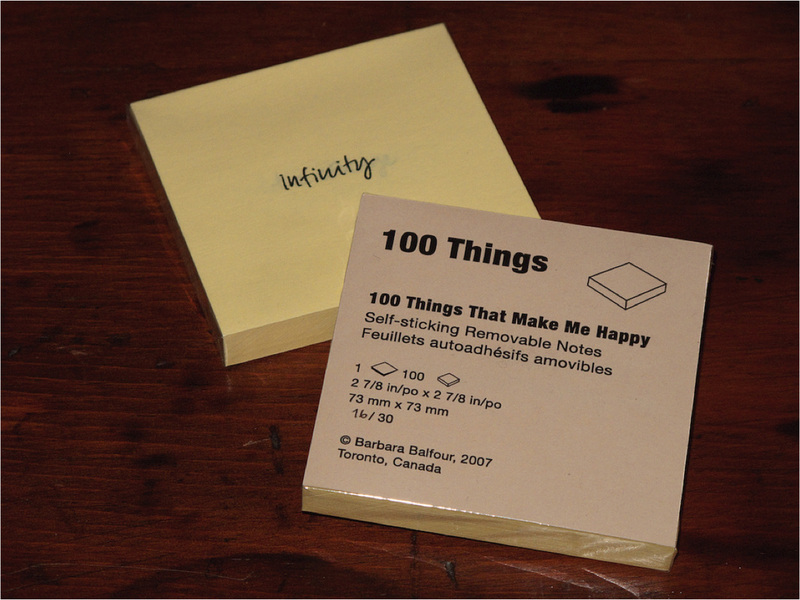 The title One Hundred Things That Make Me Happy seems to invoke a self-evident desire, yet the work itself reveals a problematic. The assumption that ‘things’ alone can make one happy is dispelled by textual references to abstract concepts, states of mind, and other dematerialized subjects. Nor is this list of things in finite form. 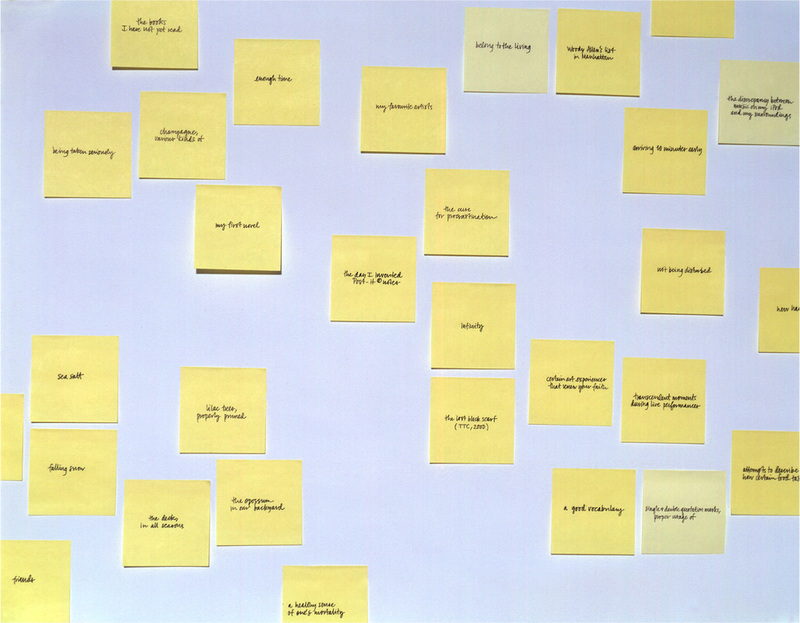 Appearing as post-it notes to oneself, temporal reminders of what is important, the one hundred references are hardly stable. Yet they do suggest a mild form of self-help, hints of how it is sometimes within one’s power to alter a state of mind for the better. Screenprinted edition of 30 reconstituted stacks. This multiple borrows the form of the ubiquitous post-it note, yet its function has been subverted. Flipping through the notes, one discovers that they are already inscribed with handwritten words and phrases. Transcribed from a list, these 100 things reveal what constituted happiness for this artist at a particular point in time. The individually screen-printed notes, reconstituted in a cellophane-covered block, pose the question: Does one keep the stack intact, or unwrap it for reading and the possible dispersal of happiness?